to download mailbox accounts for audit purposes in accordance with the Customer Agreement. To improve the security of the data retrieved, the service creates a PGP-encrypted copy of the mailbox which can only be decrypted by providing the corresponding RSA key. When decrypted, the exported mailbox will be in mbox format, a standard file format used to represent collections of email messages. The mbox format is supported by many email clients, including Mozilla Thunderbird and Eudora. If you don’t want to install a specific email client to check the content of exported mailboxes, or if you are interested in automating this process and integrating it with your business logic, you can also programmatically access mbox files. Let me know your favorite way to parse mbox-formatted files by commenting on Google+. For any questions related to the Email Audit API, please get in touch with us on the Google Apps Domain Info and Management APIs forum. Google Apps domain administrators can use the Email Audit API to download mailbox accounts for audit purposes in accordance with the Customer Agreement. To improve the security of the data retrieved, the service creates a PGP-encrypted copy of the mailbox which can only be decrypted by providing the corresponding RSA key. 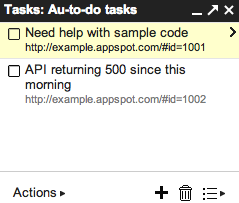 Introducing the next version of the Google Calendar API! If you’re new to the Google Calendar API, getting started is easy. Check out the Getting Started Guide, which will walk you through the basic concepts of Google Calendar, the API, and authorization. Once you’re ready to start coding, the Using the API page will explain how to download and use the client libraries in several languages. If you’d like to try out some queries before you start coding, check out the APIs Explorer and try out some example queries with the new API. Developers already using older versions of the API can refer to our Migration Guide. This interactive guide offers side-by-side examples of the API in v2 and v3 flavors across both the protocol and multiple languages. Simply hover over the code in v2 (or v3) and see the equivalent in the other version. With our announcement of v3 of the API, we’re also announcing the deprecation of the previous versions (v1 and v2). The older versions enter into a three year deprecation period, beginning today, and will be turned off on November 17, 2014. We’d love to hear your feedback on the Google Calendar API v3. Please feel free to reach out to us in the Google Calendar API forum with any questions or comments you have. We’ll also be hosting live Office Hours (via Google+ Hangout) on 11/30 from 8am-8:45am EST to discuss the new API. We hope to see you then! in Apps Script, we get a lot of requests to support event callbacks that are handled in the user’s browser. For example, if your application has a form, you may want to disable a button after it is clicked the first time. Until now, the only way to do that would be by using an event handler on the server to disable that button. Using Client Handlers, your application can now respond to events in the browser without the need to perform a round trip to Google Apps Script servers. By cutting out the round trip to the server, your app can respond instantly to user input. Imagine, for example, you want to provide your users with instant feedback within your app when a user types text where a number is expected. Ideally, you would want to warn users as they type the value, instead of waiting until the form is submitted. Having a server event handler for each keystroke is definitely overkill for such a simple and common task. Luckily, these use cases are now supported with Apps Script’s new Client Handlers and validators! A Client Handler allows you to react to any event in a browser without connecting to the server. What you can do in response to an event is limited to a set of predefined common actions, but you have a lot of flexibility in making your app more responsive. Create a Client Handler just as we would create the server handlers you all know and love. Define the target widget for this handler. The target widget is the widget on which the handler will take action. We set the handler’s target in one of two ways: (a) By using the forTargets method to define the target widget. (b) By using the forEventSource method which lets widget wire itself to the client handler. In the above example, we set the handler’s target to be the event source, so that it will apply to the button that is clicked. Finally, we define the action that the handler should take, in this case disabling the button using setEnabled(false). Aside from setEnabled, you can also change styles using setStyleAttribute, change text using setText, and so on. One Client Handler can perform multiple actions — just chain them together - and you can even change the target so that some actions apply to one set of widgets and some actions to another set. In our example, along with disabling the button, we set the handler to display the label when it is invoked, using setVisible. Another new addition to Apps Script is support for validators in handlers. Validators allow handlers to check simple and complex conditions before they are invoked. For example, the following application adds two numbers given by the user, while using validators to make sure the server is only called if both of the text boxes contain numbers. There’s a variety of validators to choose from that perform different tasks. You can verify the input to be a number, an integer, or an e-mail address. You can check for a specific length, or for any numerical value in a defined range. You can also use general regular expressions. Lastly, each validator has its negation. Note that validators work with both client and server handlers. All of these features can be used to create more advanced and responsive applications. Client handlers can be used to change several attributes for widgets, and validators can help you check a variety of different conditions from well formed email addresses to general regular expressions. If you'd like to chat about these new features or have other questions about Google Apps Script, please join several members of the Apps Script team in the Google Apps Developer Office Hours on Google+ Hangouts tomorrow, Wednesday November 16th at 10am PST. You can also ask questions at any time in the Apps Script forum. Omer was an intern on the Google Docs team for the summer of 2011. He is now back to pursuing his master’s degree in the field of cryptography. When it comes to writing UI applications in Apps Script, we get a lot of requests to support event callbacks that are handled in the user’s browser. For example, if your application has a form, you may want to disable a button after it is clicked the first time. Until now, the only way to do that would be by using an event handler on the server to disable that button. Using Client Handlers, your application can now respond to events in the browser without the need to perform a round trip to Google Apps Script servers. Join us at the Google Apps Developer Hackathons! The hackathons enable teams of developers to build something integrating the Google experience into a product. Come to the hackathons for fun, food, and the experience. Increase your knowledge of the Google Apps developer platform, while also building something really cool. Meet other developers, Google engineers, and share stories of your integrations and experience. We are handing out prizes for the best projects, including the best new projects, and the best integrations into existing projects -- more details, including the rules and prizes, will be sent out to registrants soon. Don’t worry if you don’t have a team or an existing project-- impromptu teams are great! Specific details of each event follow. Space is limited, so make sure to register as soon as possible. Confirmation emails are sent to accepted registrants. Drinks, after-lunch snacks, and dinner will be provided. Please bring your laptop. Power and wireless internet access will also provided. We are very excited to invite all Google Apps developers to our upcoming round of hackathons! We are hosting the hackathons at our Mountain View, CA campus, and at our New York City campus. OAuth 2.0 Playground: Open to Developers! at the same time as our hangout. Given the strong interest in these Office Hours, we’re going to continue doing Hangouts with the Google Apps developer community. Some will be general Hangouts where all types of questions related to the Google Apps APIs will be welcome. Others will be focused on individual products and include core software engineers and product managers who are building the APIs you love. We’ll continue adding more Office Hours on the events calendar, and announce them on @GoogleAppsDev and our personal Google+ profiles. Two weeks ago, we had our inaugural Office Hours on Google+ Hangouts, bringing together Google Apps developers from the UK, Ireland, Russia, Brazil, Germany and the US to chat. Everyone asked great questions and provided feedback on many of the APIs. It was also exciting that Google+ for Google Apps was announced at the same time as our hangout. is a great tool to learn how the OAuth flow works. But at the same time it can be used to generate a "long-lived" access token that can be stored, and used later by applications to access data through calls to APIs. These tokens can be used to make command line tools or to run batch jobs. In this example, I will be using this token and making calls to the Google Provisioning API using the Python client library for Google Data APIs. But the following method can be used for any of the Google Data APIs. This method requires the token is pushed on the token_store, which is list of all the tokens that get generated in the process of using Python client libraries. In general, the library takes care of it. But in cases where it’s easier to request a token out of band, it can be a useful technique. 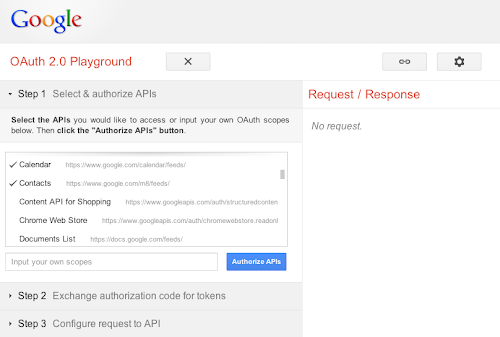 Step 1: Generate an Access token using the OAuth Playground. Choose scope(s) of every API you want to use in your application (https://apps-apis.google.com/a/feeds/user/ for the Provisioning API) . Here you can also add scopes which are not visible in the list. Enter your consumer_key and consumer_secret in the respective text fields. The consumer_key identifies your domain and is unique to each domain. Request token: This will call Google’s OAuth server to issue you a request token. Authorize: This will then redirect you to the authorization URL where you can authorize or deny access. At this point if you deny the access you will not be able to generate the Access token. Accepting this will convert the Request token generated in the last step into an Authorized Request token. Access token: Finally, this step will exchange the authorized Request token for an Access token. After the last step the text field captioned auth_token in the OAuth Playground has the required Access token and that captioned access_token_secret has the corresponding token secret to be used later. Step 2: Use the above token when making calls to the API using a Python Client Library. Here is an example in Python which uses the OAuth access token that was generated from OAuth Playground to retrieve data for a user. It is important to explicitly set the input parameters as shown above. Whenever you call SetOuthToken it creates a new token and pushes it into the token_store. That becomes the current token. Even if you call SetOauthToken and SetOAuthInputParameters back to back, it won’t set the input params for the token you set. You can use the long-lived token to make command line requests, for example using cURL. It can be useful when you need to counter-check bugs in the client library and to test new features or try to reproduce issues. In most cases, developers should use the client libraries as they are designed, as in this example. Gunjan is a Developer Programs Engineer working on Google Apps APIs. Before joining Google, he completed his degree in Computer Science & Engineering from Indian Institute of Technology, Roorkee. The OAuth Playground is a great tool to learn how the OAuth flow works. But at the same time it can be used to generate a "long-lived" access token that can be stored, and used later by applications to access data through calls to APIs. These tokens can be used to make command line tools or to run batch jobs.